It was a scorching day in Los Angeles, when we visited the Shrine Auditorium to speak with the cast and filmmakers of Despicable Me 3. 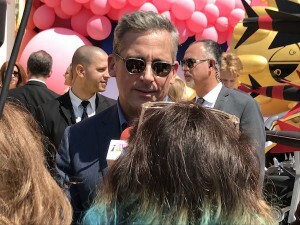 It was nice to talk with Steve Carrell (Gru) and Dana Gaier (Edith) again, as well as special guest Becky G. We got a little behind the scenes scoop on the movie’s production as well. And, of course, we had to chat with everyone about minions! I enjoyed speaking with the filmmakers and special guests at the premiere of Disneynature’s Born in China. I love animals, so it was especially gratifying to get a peek behind the scenes at how they made this magnificent documentary – the amazing work they put in to capture these creatures in their natural habitat. It was also interesting to find out which animals the special guests, many from Disney and ABC shows, were most interested in. This was my thirteenth year reporting on CES in Las Vegas! My interviews are listed below, alphabetically by company. You can also jump to them from these links: Girl Scouts, House of Marley, Intel, LG, Polaroid, Sphero. Teen Choice Awards – Then and NOW! We’re excited to announce we’ll be covering the Teen Choice Awards 2016 red carpet this weekend! Tune in to the Teen Choice Awards on your local Fox affiliate, July 31st at 8pm (7pm CT). This year the Teen Choice Awards are hosted by Victoria Justice and John Cena. Check out our coverage from the 2009 TCAs below. The stars were out and the weather was perfect. Let’s find out what they had to share about the holidays and what they’re thankful for this year. Many thanks to Raymond, for coming by our studio for this interview. We’ve watched him grow over the years, and are so proud of the young man he’s become. This is a great opportunity for him, and we know this movie will be a big hit! Be sure to check out Disney/Pixar’s The Good Dinosaur in theaters November 25th. We got a chance to visit the set of the brand new Disney XD Show, Gamer’s Guide to Pretty Much Everything, where we interviewed the stars of the show. It was great meeting Felix, Murray and Sophie, and seeing Cameron again! I talked to Kelli at the premiere of Jupiter Ascending. 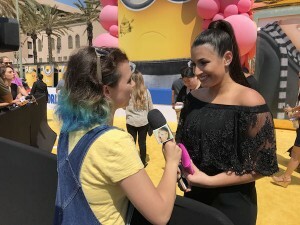 It was nice to see her again, and get the scoop on the 4th (and most likely last) season of Disney XD’s Lab Rats, plus another project she has coming up.